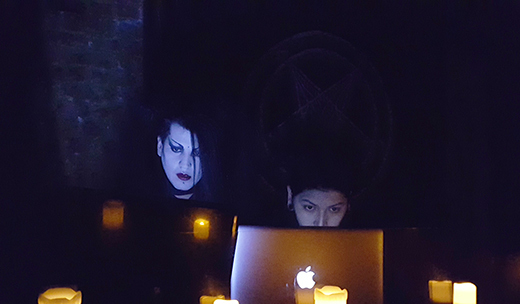 Since sometime late last summer, promoter Ana Vice has been hosting a small group of DJs for a mid-week monthly Goth social and dance night at a uniquely eerily decorated bar, appropriately called Bedlam, in Manhattan’s Alphabet City. The night is called “Memento Mori” and it is held one Thursday a month. Bedlam, as is well known, was a notorious old school mental hospital, and this namesake venue lives up to both the medical and the mental reputation of the institution. 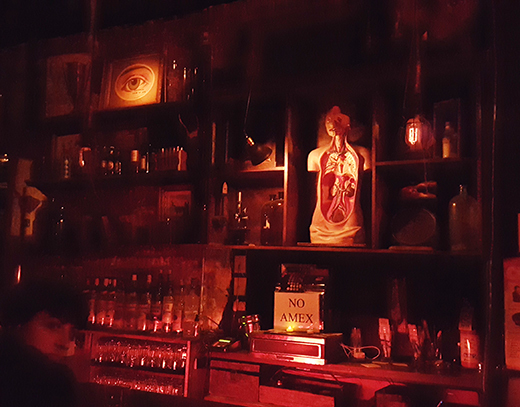 Antique anatomy charts and gruesome anatomical models adorn the walls. Facsimilies of human bones are distributed at each of the sitting booths where ornamental cobwebs are strewn. Among the DJs, Mike Stalagmike of Defcon has a modest, low-key and friendly aspect about him, but Mexican import Bela Lugosi Alex and stunningly androgynous Valefar Malefic go all the way with their looks, each manifesting monumental coiffures and morbidly beautiful male vampire appearance. The music is decidedly of the darkwave/coldwave dance variety, but there was no place for the conventional classics. No Sisters of Mercy. No Cure or Depeche Mode. Nor were they missed, because these DJs dug deep into the realm of Goth, with selections from such rarely played artists as Xmal Deutschland, Black Ice and Virgin in Veil. A fair number of tracks were unidentifiable, but nonetheless as pleasurable and hypnotic as they were melancholy. Doors opened at 10 pm and about 30 or so patrons were in attendance, most arriving between 11:30 and midnight. All were decked out in blackest of black finery, boots, veils and fishnets as well as high make-up and serene attitude. Not more than a handful of dancers were on the floor at a time. Most attendees stood at the bar and engaged in conversation where a surprisingly festive undercurrent pervaded the generally restrained gathering. A more beautifully attired and groomed crowd is rarely seen, even in the bowels of New York’s deepest, dark demimonde. 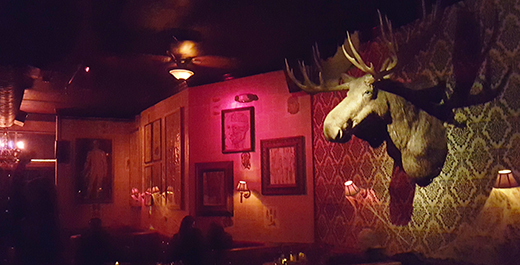 A spectacular event – the last of its kind – was hosted by impresario and fangmaster Fr. Sebastiaan on Sunday, Valentine’s Day, at Slake (formerly Downtime at the Batcave) calling itself the 20th anniversary of the annual “Anti-Valentine’s Vampire Ball” – up to now a regular, recurring event. Gatekeeper Victor Magnus, prolific writer on various dark subjects, and celebrity co-host greeted the 400 or so revelers who attended the occasion – newcomers as well as habitual, perennial attendees. Impresario Fr. 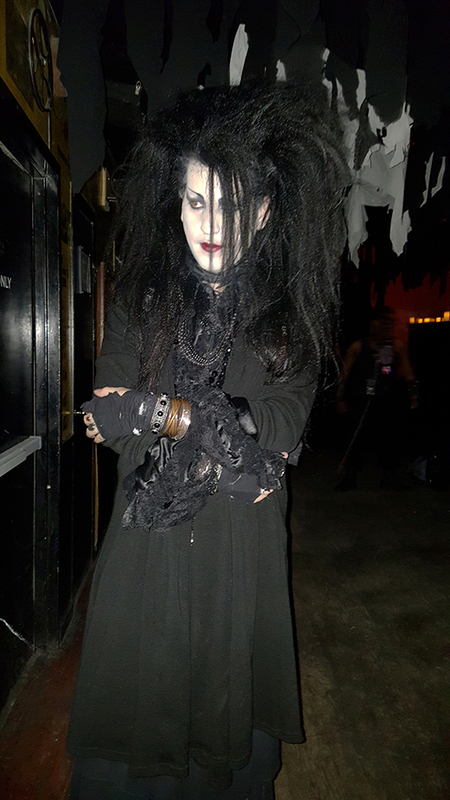 Sebastiaan van Houten has been hosting Goth and vampire-themed events going back to 1997, at which time they were termed “Long Black Veil” nights, and originated at the famous Mother club in Manhattan’s Meat-Packing district. His skill at crafting wearable, vampire-like fangs under the auspices of Sabretooth, the association he founded, placed him at the pinnacle of the metropolitan vampire fan community that had been growing alongside New York’s dark music scene. When Mother closed in 2000, he moved his events, first to Club True, then to Rare, the Bank, Drom and most recently to Jekyll & Hyde. Presently he hosts too many events and club nights – in the U.S. and various cities in Europe – to catalogue for this report. Belly dancing, striptease and even lyric opera performances provided the entertainment interludes for the evening. Since there is a strict dress code (vampire, steampunk, fetish or all-black), and since many of the more imaginative and exhibitionistic guests far exceed the standard, there were, as always, two costume contests, one for women and one for men. 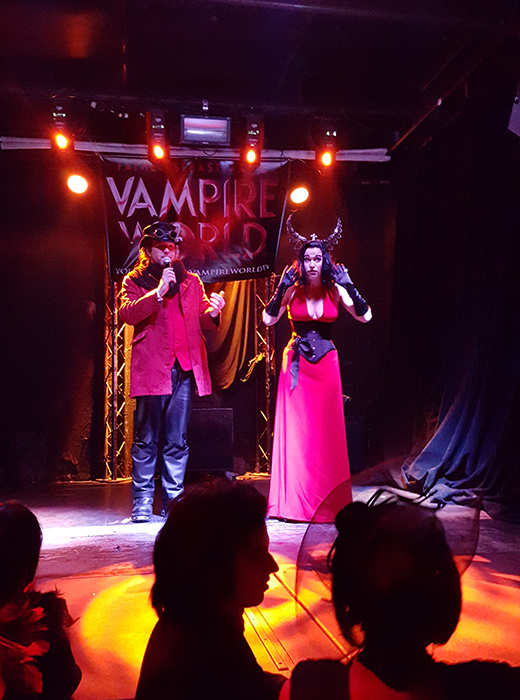 The two winners were awarded tickets to the Vampire Ball in New Orleans this upcoming Halloween. Besides presiding, along with some of his inner circle at the costume judging contests, Fr. Sebastiaan took ample opportunity to address the crowd, warmly expressing appreciation for their attendance and support. He led the audience of devotees in the ritual howl, by which all paid homage to some departed members of the Sabretooth Clan. Music was provided throughout the three-story Slake. On the main, ground floor spinning was by DJs Aengel, V Christ and Xris Smack. Up on the third floor was the uncomfortably chilly Red Room where Sean Templar and Jeffo played a different selection of the classic Goth. Skinny Puppy, Joy Division, Depeche Mode and Bowie got ample airing in both dance areas, and alternated with U2, the Psychedelic Furs, Ministry and Dead Can Dance and more. Fr. Sebastiaan announced that this would be the last ever Anti-Valentine’s Vampire Ball he would host in NYC, having made arrangements to move to San Francisco, where he intends to become involved in similar events. So all good things must eventually come to an end. This last entry in the twenty-year series provided a joyful grand finale for all who attended and participated.